OMG! I just had this happen – with a recipe I use all the time. The only difference was I used a cylinder mould when I normally use a long loaf – I wonder if this was the cause? I could feel it getting very hot and just knew what the result would be. I have made this recipe loads of times but this is the first time I’ve used eucalyptus e.o. and also the first time I’ve used a cylinder mould. I did not insulate and temp here in NZ still quite cool so just left it on the counter-top to set. this hasn’t happened to me yet. soap is such an interesting thing to make! so many things to do, use and so many things that can go wrong! 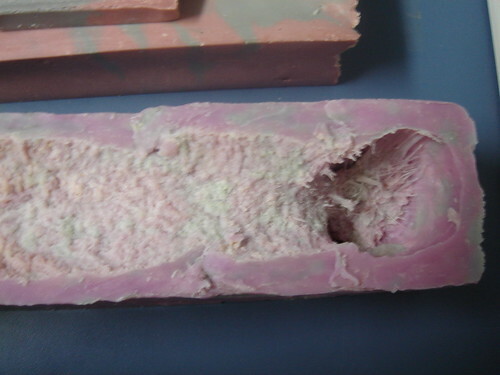 Would it be possible to pour another new batch of soap into the cavity of this? 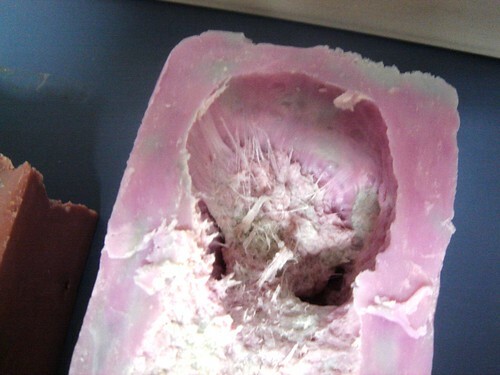 That could be a cool way to rescue a wonky looking soap? Is the volcano soap still ok to use as well? Hi Anne-Marie, first off this way an extremely helpful article, and second ( and I would have posted this elsewhere I just wasn’t sure where ) but I went from MP to CP and I recently tried Hot Process in the Crock Pot which was a ton of fun, but one thing I don’t see alot of tutorials on is Man Soap. I know there are different kinds with Charcoal, and Bentonite, and Shave Soaps. I was wondering if you knew any good recipes for any of these? hi im new round here from england wat channel does ur fabulous show come on? I’m glad you show the mishaps, as well as your pretty soaps. This is great teaching!